The Right Features. The Right Price. The Smart Way To Connect All Your Associates. 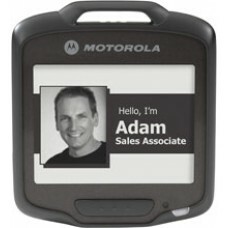 If your associates are wearing the powerful SB1 smart badge from Motorola, they can. The SB1 is a brand new category of mobile device that you can give to every one of your retail associates. This truly smart badge is full of the features every associate needs to deliver the best customer experience, with the connectivity needed to keep them productive, every minute of every day. Motorola SB1 Accessories - Cra..
Motorola SB1 Accessories Cradle, 1 Slot SB1 Char..
Motorola SB1 Accessories - Spe..
Motorola SB1 Accessories Speaker Adapter SB1 wit..
Motorola SB1 - Smart Badge, E Ink Display, 802.11b/g/n Wi-Fi, Omnidirectional 1D/2D Scanning, Push-to-Talk. Single unit. Tags: Motorola SB1 - Smart Badge, E Ink Display, 802.11b/g/n Wi-Fi, Omnidirectional 1D/2D Scanning, Push-to-Talk. Single unit.